Locate the water heater’s incoming water shut off valve. As you face the heater, the shut off valve is usually found on the right side, above and behind the heater. There are two types of valves that you will encounter. Most common is the “Gate Valve”, which has a handle that you turn clockwise to stop the water. Less common, but easier to operate is the “Ball Valve”. 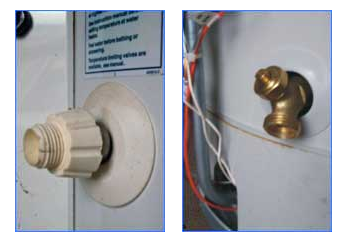 With a ball valve, a simple 1/4 turn will positively shut off all water to the water heater. Just like with the gas shut off valve, the ball valve is OFF when the handle is perpendicular or “cross ways” with the pipe. Once the water is off, then you simply open the drain valve up. One more step is required to get water to drain, and that is to allow air into the tank so that the water will flow out. This can be accomplished by breaking the seal on a water heater flex connector; or by opening the manual lever on the Temperature and Pressure Relief Valve; or by opening hot water faucets in the home. If the drain flow is minimal, the drain valve may be clogged with debris. You can try to use the house water pressure to clear the clog by opening the water supply to the home for a second or two. If this doesn’t work, it is our recommendation that you hire a professional. and get to know us! Call (206) 622-3303 today or schedule an appointment online now to get details about this service and program only from Washington Water Heaters.